October in the United States means a shift to fall and all the Halloween festivities, chunky knit sweaters, and pumpkin spice lattes that colder weather and holiday spirits bring. Indonesia’s Fulbright English Teaching Assistants (ETAs) are likewise dressing up (in regional, traditional clothing instead of costumes), experiencing a change in the weather (as monsoon season descends on parts of the country), and celebrating a recent holiday (Islamic Idul Adha). It is certainly a different experience, and we are ready and excited to launch Indonesiaful’s second year and share our insights into this incredible country. 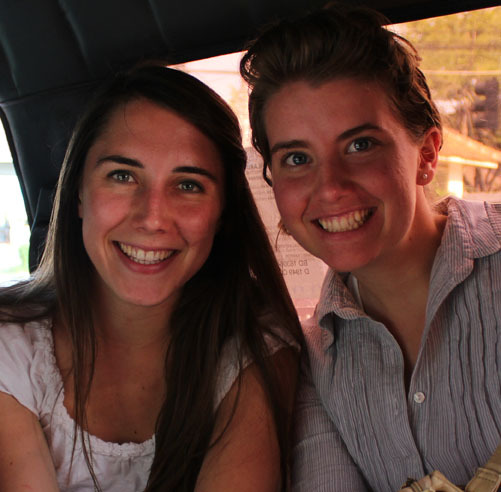 The two Co-Editors-in-Chief, Kelsey and Anna, riding an angkot together during their first year, as part of the ’12-’13 ETA cohort. Indonesiaful is a collective effort by a group of recent college graduates (ETAs) from the United States, who have applied to live and teach in Indonesia for a nine-month grant period. Our cohort of 35 ETAs is spread across 18 cities and seven islands in the fourth most-populous country in the world, teaching Grade 10 students in public and private high schools. Just as the regions and cultures of Indonesia vary, so do the experiences of these ETAs. We each bring our own skills, backgrounds, and personalities to promote English-language learning and act as points of exchange between the U.S. and Indonesia. Indonesiaful is meant to capture this diversity rather than speak to one Indonesian experience. This grant period we have a new group of eager ETAs who have pushed us to reimagine Indonesiaful’s future. In the coming months, the site will undergo a small makeover, expand the bounds of our content (adding comics, expanded photo essays, and potentially short videos), and continue to share our experiences, knowledge, and adventures with people from the U.S. and beyond. Hopefully, Indonesiaful can serve as a resource for people who are interested yet unable to make it across the ocean. As always, we look forward to your comments, thoughts, and encouragement. You can email us at indonesiaful@gmail.com. Thank you for your continued support, and get ready for some great posts this week about living differently, Idul Adha celebrations, environmental issues, and exploring! This is not an official Fulbright Program site. The views expressed here belong entirely to the authors and do not represent the views of the Fulbright Program, the U.S. Department of State, or any of its partner organizations.